While the LHC sectors cool down and reach the cryogenic operating temperature, spirits are warming up as we all eagerly await the first collisions. No reason to hurry, though. Making particles collide involves the complex manoeuvring of thousands of delicate components. The experts will make it happen using a step-by-step approach. The short version of a recipe for colliding particles would be: produce the particles, bunch them, assemble the bunches into two beams, accelerate them while sending them in opposite directions, so that the particles finally collide. Whilst this might seem straightforward, each step requires thousands of magnets to work perfectly, thousands of control system components to provide the necessary go-ahead, and thousands of electronic components to perform impeccably. At CERN, beams are prepared in the smaller accelerators and eventually sent to the LHC through the transfer lines. During the week-end of 26-28 September, particles (protons first and then ions) were sent to the entrance of the LHC, thus showing that the whole injection chain is working well and is ready for injecting particles into the LHC. At the same time, the LHC is preparing to welcome beams again but, in order to do so, the whole machine has to be at the operating temperature of 1.9 K (about -271 °C), the new Quench Detection System (http://cds.cern.ch/record/1207352?ln=en) must be installed and tested in all eight sectors and current must be passed through all the 9000 magnets (without beam). The new system is extremely complex. The first indication is that it’s performing well, but it will take considerable time to test fully and to commission. 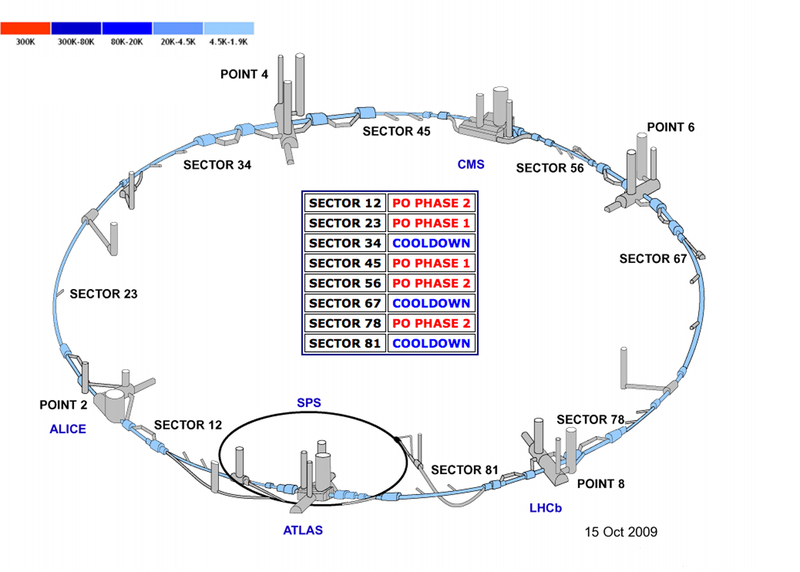 According to the schedule, beams will enter the LHC about 5 weeks from now at an energy of 450 GeV, the maximum energy the SPS (the last accelerator in the injection chain) can provide. They will then make their first turn round the LHC. Initially, one bunch of protons will be injected and guided clockwise in one of the twin beam pipes. If this goes well, some hours later a second beam will be injected anticlockwise into the second beam pipe. One to two weeks later, both beams will travel at the same time in the two rings of the machine. Once stable beams have been established, they will be made to collide in the four interaction points. At this moment, the experiments will see the first low-energy collisions and the sprays of particles produced. Although not very relevant for physics, these data will be important for fine-tuning the detectors. The operation team will then aim to ramp up in energy, gradually increasing the current in the magnets, and accelerating the beam with the radiofrequency cavities. This will initially be done with each beam in turn and then with the two beams at the same time. As soon as there are two stable beams, the team will aim to collide them at higher energy before the Christmas period. More than 10 000 magnets distributed over more than 30 km will be involved in the operations to achieve the first high-energy collisions. The whole chain will have to work like a Swiss watch. And, just as in a real watch, the outside doesn’t show all the complex mechanisms and components that make it work are not visible on the outside.